SWANSEA CITY have issued a statement confirming Liverpool’s interest in Joe Allen and expressing their disappointment that details of his contract have been released to the media “by parties outside the club”. Various outlets have reported that Allen has a clause in his contract, signed a year ago, allowing him to leave should a bid of £15m be lodged with the Welsh club. Although Liverpool had confirmed their interest in signing the player, they would not confirm if any official approach had been made to Swansea for Allen to team up at Anfield with former Swans boss Brendan Rodgers. Swansea statement adds their own confirmation of Liverpool’s interest alongside a claim that there has also been interest “from other clubs”. Allen is currently with the Team GB Olympic squad. Of course clubs are not supposed to approach players of any other club without permission from that club anyway – not that it means that never happens – so on the face of it the agreement only asks Liverpool to follow existing rules on player approaches. If so it would seem Liverpool and Rodgers have not broken that agreement if their only approach has been directly to Swansea. Some reports suggested Liverpool had enquired about taking Allen for £10m plus the loan of Jonjo Shelvey, with Swansea holding firm on the £15m figure said to be in his contract. Today’s statement suggests the two clubs are no nearer coming to a compromise. A Swansea City spokesman said: “Swansea City can confirm that Liverpool have expressed an interest in Joe Allen, despite a written agreement with Liverpool not to approach any players within the 12-month period of former manager Brendan Rodgers leaving for Anfield. “There has also been interest from other clubs regarding his possible availability and the club is due to speak to Joe, as originally planned, about the situation when he returns from GB duty. “The club is not prepared to release any details on whether any formal bids have been made at this stage or details of Joe’s contract, which are private and confidential. The club is extremely disappointed that speculation regarding certain aspects of his contract have been released to the media by parties outside the club. * Liverpool play Roma at the home of the Boston Red Sox tonight, kick-off at Fenway Park is 11.30pm UK time with the game being shown live on ESPN. Swansea say they are disappointed about speculation but that’s what happens. Rodgers only ever said he would be a player their interested in if available. Only people who said there’s been an enquiry. If they don’t like things public should shut up.. I reckon they are just looking to start an auction. 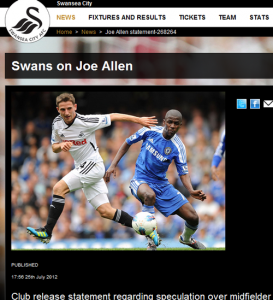 Leave Allen at Swansea will nit be worth £5m next season now everyone knows him. Looks like we may lose out on Allen due to Spurs sniffing around. They will offer bigger wages and signing on fee, plus are a bigger and more attractive club than LFC at the moment. Spurs a bigger club ? Liverpool sell more shirts around the world in one year than Spurs would in 20 years. Get real peanut . I have done the Spurs stadium tour. You only have a small glass cabinet to show all your achievements. Come to Anfield museum if you want to see what a big club is. I’m from Melbourne , and i never see any Spurs shirts around. Big club my arse . Don’t make me laugh. Why do we keep feeding the media? Every summer we run into these transfer rows in the press. The Carroll situation what a mess. Suarez last week ( move on lad ) He needs the Moran big stick treatment. Warners comments on dalglish this morning, unnecessary. Can they not just shut up get on with the deals that need to be done. Over the last 10 years Man U never seem to get into these media dabates. Hardly any focus on them or comments from Man U sources on Van Perse, but I bet they get their man. Even their failed aborted share issue hardly got a mention this morning. They know how to play the press. Warning to LFC as time goes on this media style is just becoming a BIG TURN OFF! It’s all part of the dance. One further point on the above subject. This is why Liverpool desperately need a Chief Executive based at Anfield to give clear direction on day to day matters and support Ian Ayres and his staff. Learn from the past when Smith & Robinson were the best operates of their generation. Its not rocket science but Liverpools set has been under resourced for a decade plus. I would also sugests that Rodgers finds a top up and coming Assnt Manager to carry the work load, something Dalglish & Benitez never addressed. Jim can you make any insider comment on these fundementals as I thought this would have been sorted this summer. I endorse Ian’s comments about needing a CEO based at Anfield. Tom and John are not daft. They must look at how other Premier League clubs are setup and realise the benefits of 1) A England-based CEO and 2) A Briton to fill that role. Brian Barwick would be an excellent choice. Currently out of work I believe and a life-long LFC supporter. Come on Jim, do some sniffing inside the club! Club still maintain they don’t need a CEO because they’ve got an MD instead. Still some appointments to be made/announced as part of what is currently being termed ‘the transfer committe’. I hope they appoint someone into a senior position. Poor Ian Ayre has too much on his plate and it’s showing. We need a hard-nosed negotiator to bring down the prices clubs are wanting for their supposed star players. We’re paying far too much! You watch the Allen deal. I bet we pay the full amount! MUFC wouldn’t and neither would Spurs. Regarding Carroll. I think BR has made his mind up far too quickly without giving Andy a fair crack of the whip. His language in the last few days looks like a bit of back-tracking to me. I wonder if he’s having second thoughts. I’d hate to see Carroll go back to NUFC for a knock-down price. It’s akin to giving NUFC £20M gratis! Possibly the worst piece of football dealing in history! It must not happen. Keep him and give him a chance. He does deserve it. I’m disappointed with the lack of progress in the transfer market. We have lost out on Sigurdsson to spurs and it looks like we will miss out on Allen and Gaston Ramirez. I see us struggling to finish top 6 this season with the current squad, it’s clear that we need a striker, winger/wide midfielder and possible CB if skrtel departs yet I don’t see the club rushing to make top signings. Part of me is starting to have reservations about FSG and their ability to invest in the club. I wouldn’t want a player who prefers higher wages to a proven manager he has worked with. Not sure why you think the deals for Allen and Ramirez have fallen through. Links? I think you misunderstood what I mean re: spurs being bigger and more attractive…I have supported Liverpool for over 20 years and will say with confidence that we are bigger than spurs, arsenal, chelsea, man city in terms of history and fan base. As a club we are in up their with Bayern Munich, Milan, Madrid, Barcelona and dare I say Man Utd. However at this moment and time Spurs (and this painfully kills me) are seen by top players as a more attractive club to join than LFC which has been proven recently with Sigurdsson.